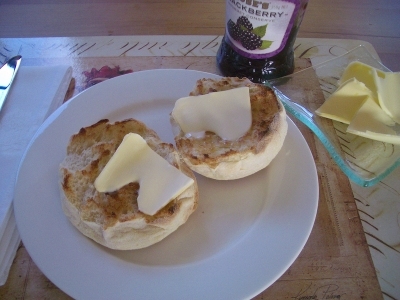 Remember when I made these English Muffins ? I discovered the recipe in the weekly food column in the New Zealand Listener . After 23 years and 936 columns the woman who brought those (Marion Maddox) English muffins to us, Lois Daish, is retiring. Thanks to the food blogging community the muffins took on a life of their own. Sam at Becks and Posh was the first to try them and was then followed by Nicky and Oliver at Delicious Days. Last week Elise at Simply Recipes mentioned them and I'm sure half of America had them for breakfast this week. I know from reading my stats they have been featured on various forums. I'm going to miss Lois. In a round about way I have featured in one of her columns. Long before I ever knew about blogging I attended a food writers workshop where Lois was a speaker. Her column the following week was based on a workshop activity we had enjoyed. Lois split us into pairs and we had to interview our partner on the question. "If you had to leave your house quickly because of a fire which cookbook would you take with you?" Interestingly the results were fairly even with half opting for the book with a collection of favourite recipes from family and friends and the half opting to save there technical cookbook which they refer to for the basics. I'm not sure who will be replacing Lois at the Listener. They better be good.